STAGE SETTING: Jessica Chinelli ’12, Kelsey Burritt ’13, Mel Balzano ’12, Michael Mayor ’14, Priscilla Alabi ’12, Melissa Martin ’13, choreographer Jacqueline O’Donnell ’11, and Mohammad Seraji ’12 (left to right) rehearse a scene from the International Theatre Program’s spring production of Shakespeare’s The Winter’s Tale. Directed by the program’s artistic director, Nigel Maister, performances begin April 14. 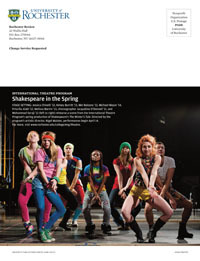 For more, visit www.rochester.edu/college/eng/theatre.